Scion xB Pros and Cons | Page 1 of 3 | Why Not This Car? What drives people to buy (or not buy) a certain car? 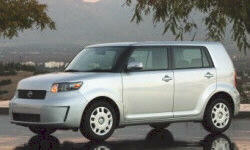 TrueDelta's members share Scion xB pros and cons based on their real-world driving experiences. I ended up buying this car (not my favorite color or interior color) based on the fact that it was a toyota with a manual, which is rare nowadays. There was no other Car that came close in price, reliability or versatility. 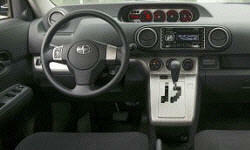 2005 Scion xB - Thumbs up! Overall, it's a great car for commuting and hauling the kids. With 82M, gas mileage check just prior to selling still indicated 29.7 mpg; this was a commuter car, 60 miles per day, AM and PM rush hours. Fuel economy has been almost exactly as revised epa estimates listed. Vehicle responds well to hypermiling techniques in hilly terrain. Bullet proof. They use the 2.4 engine that has been extremely reliable in all Toyotas. I average 24.5 mpg on my regular city commute. I consider it impressive for a utility wagon. I have gotten under 30 once - when travelling into 40 MPH wind. Gotten as high as 37 hiway. At the time, it was unlike anything else on the road. The square box was just something I was naturally attrated to. 2-3 pg less than the cube. No haggling involved, and the price is in line with its competitors like the Nissan cube and Kia Soul. On the other hand, esp. during this economy, there are no deals to be had, unless you consider a $300 Best Buy gift card to be a deal. I like the real boxy eterior styling, and I think it manages to look a little sporty without being to "tuner". Very roomy, lots of aftermarket for customization.